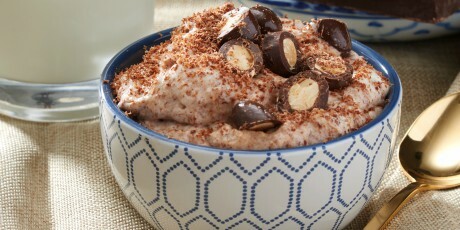 A rich mousse made with chocolate and almond butter. 1. In large bowl, beat cream, vanilla, and salt until stiff peaks form. 2. In another large bowl, beat egg whites until soft peaks form. Slowly beat in sugar and continue beating until stiff, shiny peaks form. Mix melted chocolate and almond butter together and then gently fold into the whipped egg whites. Gently, but thoroughly fold in whipped cream. 3. Spoon into 4 dessert dishes, garnish with chocolate almonds, chocolate curls and refrigerate until ready to serve.